Columbus Blue Jackets defenseman Dalton Prout (47) skates with the puck as Ottawa Senators left wing Clarke MacArthur (16) trails the play during the first period at Nationwide Arena. 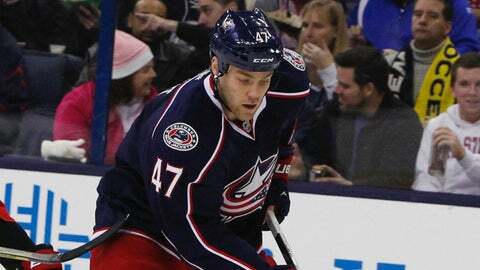 COLUMBUS, OHIO — Columbus Blue Jackets defenseman Dalton Prout has been placed on Injured Reserve retroactive to December 16, club General Manager Jarmo Kekalainen announced today. Prout suffered an upper body injury during Monday’s game against the Winnipeg Jets and is expected to miss two to three weeks. Prout, 23, has recorded two assists, 29 penalty minutes and 41 blocked shots in 24 games played with Columbus this season. He tallied one goal and six assists for seven points with 25 penalty minutes and a +15 rating in 28 games with the Blue Jackets during the 2012-13 campaign, leading the club in plus/minus while ranking second among rookie NHL defensemen in that category. A native of Kingsville, Ontario, Prout was Columbus’ seventh pick, 154th overall, in the 2010 NHL Draft. The 6-3, 222-pound defenseman has recorded 1-8-9, 54 PIM and a +9 rating in 57 career NHL games. He has also registered 5-17-22, 127 penalty minutes and a +3 plus/minus rating in 102 career AHL games. The Blue Jackets return to action on Thursday when they visit the Philadelphia Flyers. Game time from Wells Fargo Center is 7 p.m. ET. Live coverage on FOX Sports Ohio begins with the Blue Jackets Live pre-game show at 6:30 p.m. The game will also be broadcast live on the Blue Jackets Radio Network, including flagship station Sports Radio 97.1 The Fan, and online at BlueJackets.com.